Well I took the plunge and decided to get a roof rack. I thought especially with TECORE coming up, I could use some extra storage. 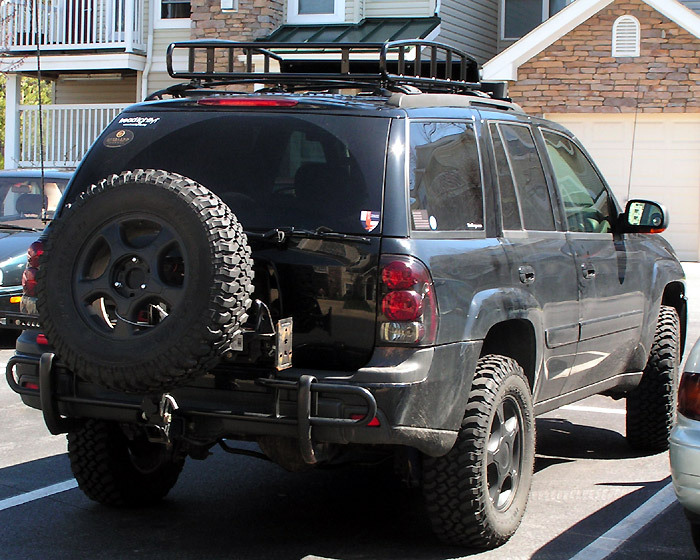 I also wanted to be able to transport some fuel... since I couldn't add that on my tire carrier, I decided a roof rack would be the best bet. So I took a look at all the options available. I wanted something that wouldn't affect gas mileage too much, wasn't too heavy, yet was strong enough to handle a big load. What I found was the Baja Rack. I believe I have the first on a TB. So I figured I'd write up a short review. It's a fully welded aluminum construction. So it's light and will not rattle. Plus, the rack is powdercoated, and not painted, which should give it some added durability. I picked mine up from Sierra Expeditions (http://www.sierraexpeditions.com/). Baja Rack offers two sizes (http://www.bajarack.com/products.html). The Mule, which I got, and the MegaMule, which I felt was just a bit too big for the TB. The rear has two tabs for rear facing lights. I'll stick some lights in there eventually. I'm still looking for some small wide angle flood lights... any suggestions? The front faring is also aluminum, and not a plastic sheet. I used the stock crossbars for the rack, which actually worked very well with the Baja Rack mounting system. Here are my Wedco gas cans in place, just so you get an idea. If any of you are wanting gas cans, the Wedco supply is running out... pick up some of the last ones at https://www.expeditionexchange.com/wedco/. I'm also hoping to get a bike rack mounted up there. Although, I'm still unsure how that will all work out. I found the flood lights that are the same size as the 4 we both have infront of the racks. I think I got them at northern tool for like $17-$18 They are really bright and light up everything behind me when I turn them on. Plus its nice to have something to get those pesky people who tailgate you off your rear bumper. That is absolutely PERFECT! Now I'm jealous. That takes a bit of doing, so congrats! I second the testimonial for Sierra Expeditions. I got my fridge through them, Pico chairs, and bunches of other stuff. For rear facing floods, I recommend the very heavy duty Maxxima 4.5" 6X1W LED work lights from Adventure Trailers. I had to return mine unused because of the layoff a week after I got them, but they were perfect for camp setup without draining the battery with 10-20 Amps of draw like other kinds of lamps. There was a ExPo special when they first listed them. Probably not anymore. They look very nice! However, I'm not sure about the price. $120 is a bit high for flood lights. Since I'll be getting 4, I think it's out of my short-term range. I'll keep them in mind though. Short term, I've got my eye on Hella Ultra Beam FF Worklamps for $45 each. How are you thinking of mounting a bike rack on there? Just wondering. I hope those crossbars hold up.. the other local guy that has a lifted tb ended up trading me a tail light for one of my cross bars. His rack is attached to the crossbars and they started to give way, or atleast one of them did. Thanks for the heads up. I'll keep an eye on them. If need be, I'll replace them with solid bars. Nice Rack James! The Hella Lights are a good Choice, many People here are using them. Im answering this thread from my iphone, so i keep it short. Your Trailblazer is awesome, keep up the good ideas! Now there's a phrase I thought I would never see on THIS site. Something you're not telling us James? I never saw a thread about this... did I somehow miss it? 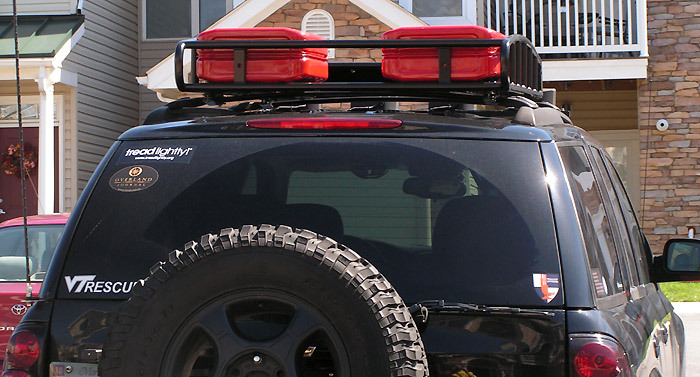 Ive been looking for a roof rack all morning, i like the style of the Baja, nice choice, looks really good James. Do you think there is enough room to stick a spare tire up there, cause thats what i am looking for? That bike mount should work, just weld a plate on the baja rack somewhere towards the front, bolt or weld the mount to the plate. Should be stable enough, thats what we did on a friends truck.